Mary Ann Weeks was born in the last year of the eighteen century to Ezra Weeks and his wife of New York City. Her father was a successful architect and a member of the New York Academy of Fine Arts. Mary Anne received a good education for a lady of her social class, studying art, literature, and "some sciences". In her late twenties, she married Martyn Paine, eldest son of Elijah Paine, prosperous owner of a woolen mill in Northfield. Martyn had received a medical degree from Harvard, practiced medicine in Montreal and then in New York City, where he became a distinguished physician and professor of medicine. He was involved in establishing the University Medical College, helped repeal a law forbidding dissection of human corpses, and published numerous articles and books on medical topics. Mary Ann employed her artistic talents by painting botanical illustrations for husband's medical lectures and writings, such as his text Materia Medica and Therapeutics. The Paines spent summers in Vermont and Maine. It was probably on a visit to her husband's family in 1837 that Mary Ann painted this view of Northfield, which now hangs above the fireplace in the south reading room of the library. 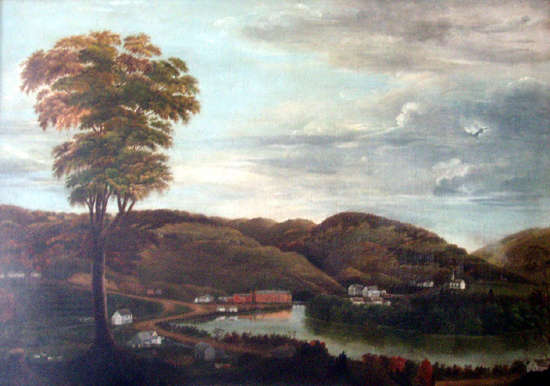 The red building at left center in the painting is the textile mill built by Mary Ann's father-in-law, Elijah around 1812 for the stupendous sum of $40,000. Elijah owned a lot of sheep to supply wool, and the mill was a shrewd investment since war with Great Britain cut off the importation of woolen goods. The mill was powered by a log dam beyond the bridge crossing the Dog River, which flows through Northfield. The nearest white building on the right bank of the river is the Northfield House, a hotel erected in 1836 by Charles Paine, Mary Ann's brother-in-law. The church at the far right is the Paine Meeting House, which Elijah built in 1836. Decades later the meeting house was cut in half and jacked up: a middle section was added and a hall was inserted beneath the structure, which today is the United Church. 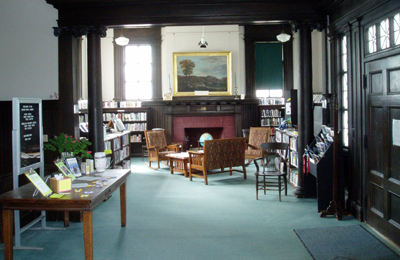 Mary Ann's painting of Northfield hung in the "Ladies Parlor" of the Northfield House for many years and then was owned by various residents of the town until eventually it was donated to the library. In 1977, the badly darkened painting was restored by Tom Clark of Perkinsville, Vermont. In 1850 the Paines vacationed with their son, Robert Troup Paine, in Wells Beach, Maine, where Mary Ann continued to pursue her interest in painting. (Wells Beach is still a favorite vacation spot for Northfield folks today.) A short while later, Mary Ann and Martyn endured a heavy blow when their son, a medical student at Harvard, died. Mary Ann, in chronic ill health during much of her adult life, did not long outlive her son, dying in 1852 of "congestion of the brain." 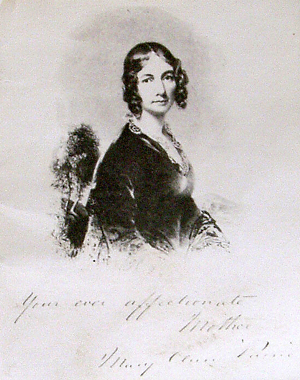 Her husband Martyn lived to be 83, dying in 1877. The undated drawing of Mary Ann Paine is inscribed "Your ever affectionate Mother Mary Ann Paine." Valuable sources of information on the history of Northfield, Vermont are Julia W. McIntire, Green Mountain Heritage: The Chronicle of Northfield, Vermont, Canaan, NH: Phoenix Publishing, c. 1974, and Julia W. McIntire and Richard L. Cleveland, Picture Northfield: A Photographic Study, Northfield, VT: Northfield Historical Society, c. 1985. See also "Voices from the Past," compiled by Sally Pedley of the Northfield Historical Society in The Northfield News, 21 May 2009, p4. Northfield's Libraries and George Washington Brown.